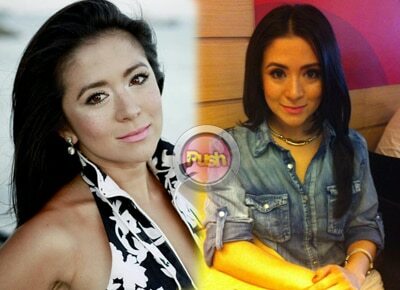 Antoinette Taus shares updates on her professional and personal life with Push.com.ph now that she is back again in the Philippines. The past few weeks have been quite hectic for Antoinette Taus. The former actress, who is now in the Philippines for a vacation, is extending her stay as offers for a couple of projects came pouring in. “I never thought that I would actually stay a little longer. Yes [there are offers], there's a few lined-up pero siyempre we just don't want to jump into anything right away so we're doing a lot of deciding and thinking right now,” she shared in an exclusive interview with Push.com.ph. She further relayed that she might be doing an indie movie and record an album in the country. “Hopefully one is an indie film for an international release which I'm super excited about. I've never done an all-English film before so I'm excited about that and then a new album, hopefully,” she said. Back in Los Angeles, Antoinette was busy with her music and her company Taus Entertainment where she is partners with her brother, former child actor Tom Taus. “Basically, he's DJing right now and also he's going to do a lot of producing very soon and we just want to produce our own music, original of course. It's going to be mostly in English, but we still want to make music for the Philippines so kahit papaano may Tagalog pa rin. And nag i-events din kami in and out of Hollywood,” she shared. Extending her stay here in the Philippines has meant that she needed to leave her pending work in the US. “I actually left behind a lot of things that I still need to be doing there, but I'm here right now, to me, I just kind of follow my heart, I mean I'm not going to stay here forever. I guess what happened is I basically got two homes now, Philippines tsaka L.A., and marami naman sa kanila nagba-back and forth na rin eh so ngayon mukhang dito muna ako for a few months and we'll see where it goes,” she said. According to Antoinette, what really motivates her nowadays are her fans so she wants to extend her gratitude to all of them. “I guess what I just want to say is thank you, sobrang nakaka-touch talaga, nakakaiyak. Hindi ko naman akalain na aalis ako ng Pilipinas ng ganon katalagal, sobrang salamat. Honestly, parati ko ring sinasabi sa inyo, alam ko kayo, ;yung nakakausap ko even online, kayo ‘yung reason kung bakit I'm so inspired and I want to keep doing what I am doing so thank you for being there for me,” she remarked.